In four short weeks, you will handle multiple real-world consulting projects in the Accelerator program. Applying what you learn in class, you’ll work in teams to devise solutions to business challenges facing real companies. Then you’ll present those ideas to each company's key executives, sometimes even the CEO (people you’d never meet in an ordinary internship). Redpepper is an innovation advertising agency based in Nashville. For this project, Accelerator students had the opportunity to meet with executives from Redpepper and one of their major clients in the consulting field. Students were tasked with developing ideas for attracting STEM students to work in this arena. See project highlights in the video. Society6 (a subsidiary of Leaf Group, Ltd.) is an established leader in the world of print-on-demand products. For this project, Accelerator students had the opportunity to ideate concepts and define a go-to-market strategy for a new physical project. They presented their ideas to a panel of executives, directors and managers from Society6 and Leaf Group. Click here to read more about this project. Or click below to watch the recap video. 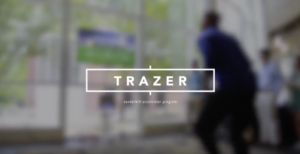 Trazer is a medical technology company based out of Cleveland, OH. For this project, Accelerator students were challenged to assess the validity of several industries and their potential profitability for a cutting edge medical product. See highlights and hear from students in this project video. 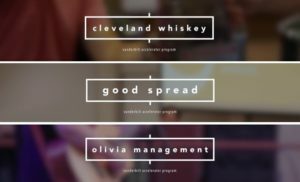 Accelerator teams had the opportunity to work with executives from Cleveland Whiskey, Good Spread and Olivia Management. Each project involved different challenges and strategies including developing a new use for an existing product, implementing a college ambassador program and creating a fan club strategy. See highlights and hear from students in this project video.